Washington offensive tackle Kaleb McGary finished his career with 43 straight starts. 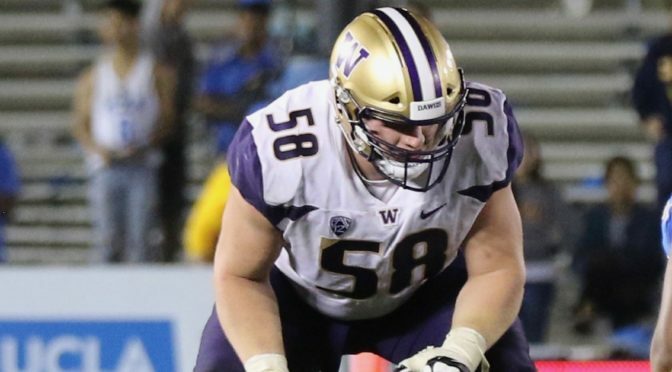 The Huskies right tackle is intent on proving to NFL personnel that his heavy-handed nature translates to multiple spots along an offensive line. His efforts include working with a former Pro Bowl offensive lineman and legendary NFL offensive line coach. DraftNasty's Corey Chavous sat down with him to talk about technique and his future prospects. McGary: Nice to meet you. Corey: Nice to meet you too man. You started off today (Senior Bowl 2019 practices, Day 1), with a very strong pass pro period and you complemented that with a strong team period. How did you feel about your first day out here? McGary: I felt like I had a pretty good day. I think I showed I'm very capable…a very good tackle. I just hope to continue to improve and show that I'm better and better as time goes on. Corey: Well you've played a lot on the right side of the offensive line, but do you feel like you're capable of playing on the left side if needed? McGary: I am. Actually the last couple of weeks I've done a lot of work with retired coach Howard Mudd (former three-time Pro Bowl offensive lineman and 40-year NFL OL coach who has since this interview been re-hired by the Indianapolis Colts) on guard and left tackle sets. I actually intend to try and jump over to the left side, even guard, if they'll let me. Corey: When you talk about being able to play multiple positions, what other positions do you feel like you can backup? Now you talked about guard. Do you feel like you're a guy who can backup all four positions and maybe be a starter at the right tackle or the left tackle spot? McGary (No. 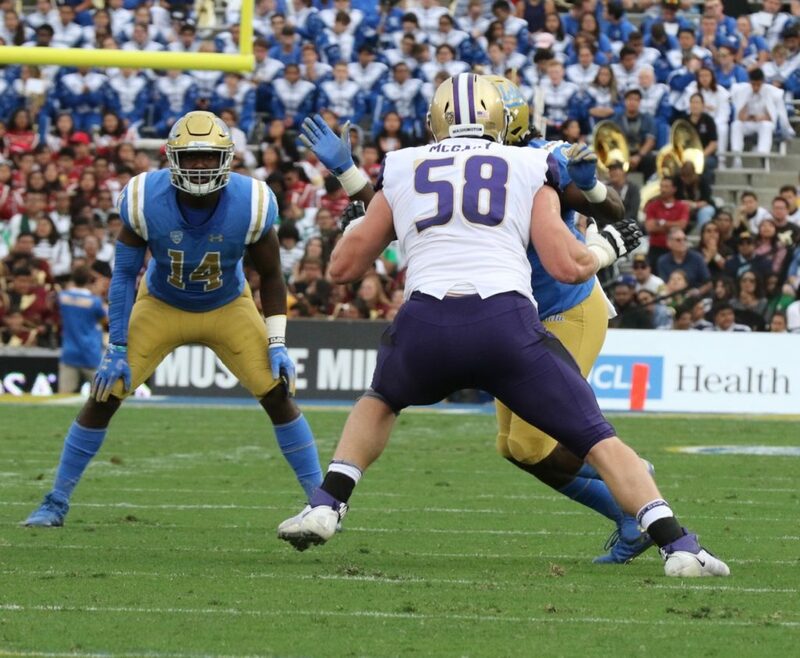 58 pictured) earned the Pac-12's Morris Trophy Award in 2018. The award goes to the conference's best offensive lineman as voted on by the opposing teams' players. McGary: I think so. I was given a lot of really good physical abilities. I'm really flexible for my size so it lets me kinda bend and get down there for a guard position. So I do. I think I'm capable and I think if given a chance I think I can earn my way into any of those four spots. Corey: Talk about your short-set technique or quick-set or whatever you would describe it as. That's something that's been very effective for you. Talk about how you've perfected that technique. McGary: Working with Coach Howard Mudd. He came up with the short-set/dish idea. And just working with him a lot over the time that I've known him. Sessions upon sessions with him, and it fits my play style. I like to be aggressive, I like to get on, get up…I don't like to leave a lot of things to question or room for them to do their thing. I like to put pressure on D-linemen. Can't wait for them to apply pressure to me. It just fits the way I go. Corey: Heavy hands. Scouts have described you as having heavy hands. Do you feel like you've got heavy hands? McGary: I think so man. I want let them know if I hit 'em. Corey: Who was the toughest opponent you went against in school? McGary: Probably my time against Greg (Gaines) and Vita Vea. Those guys are big, brawny, just freakin' boulders. Playing against them every day made me what I am I think or it's a large part of it, having to go against that kind of ability. Corey: Look forward to you having a great NFL career man..
Corey: Nice to meet you.